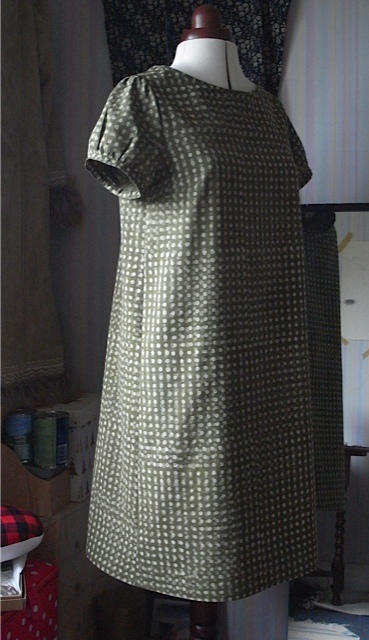 This dress bothered me the last time I tried to wear it. It just didn’t feel right. 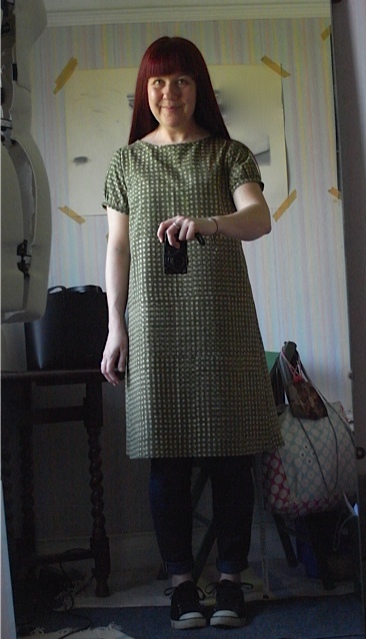 I wondered what it might look like shortened into a tunic. 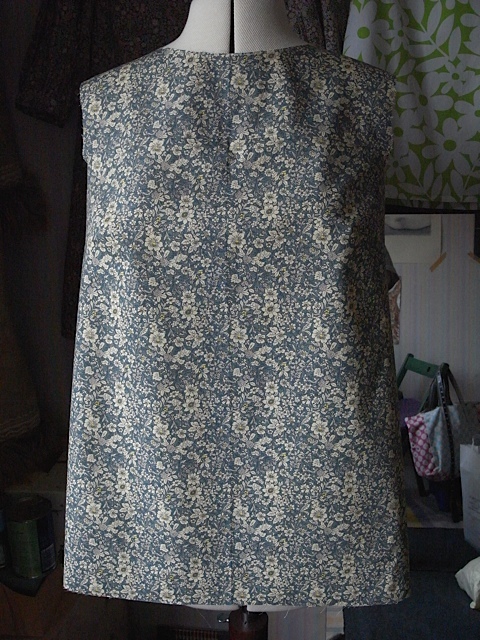 As I was too tired to focus on a full sewing project I decided the only way to find out was to do it. I’m not sure if I prefer it or not, but its too late now, its done. 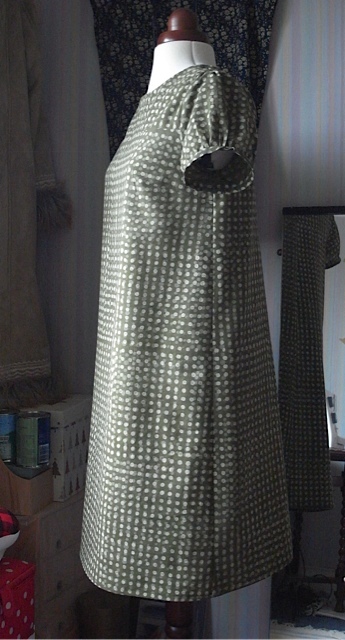 I’m wondering if half the problem is the fabric itself. 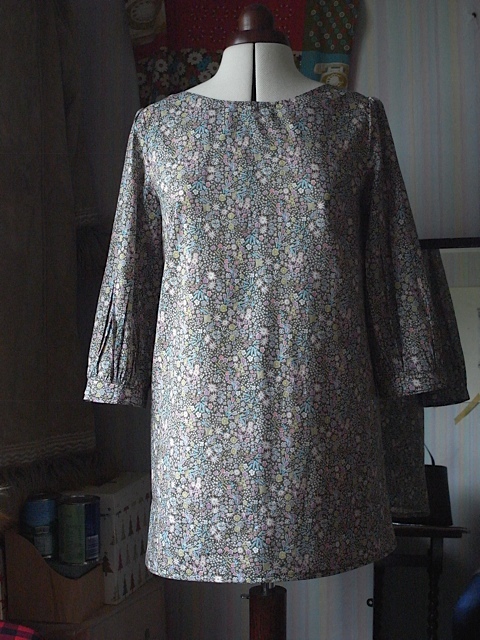 Whilst I love the Liberty tana lawn fabric, it creases like buggery the minute you put it on, as you can see from the picture. And I just don’t feel right when my clothes are all creased from the start. Its different if you’ve been wearing them all day for them to be creased, but at the start of the day I think not! 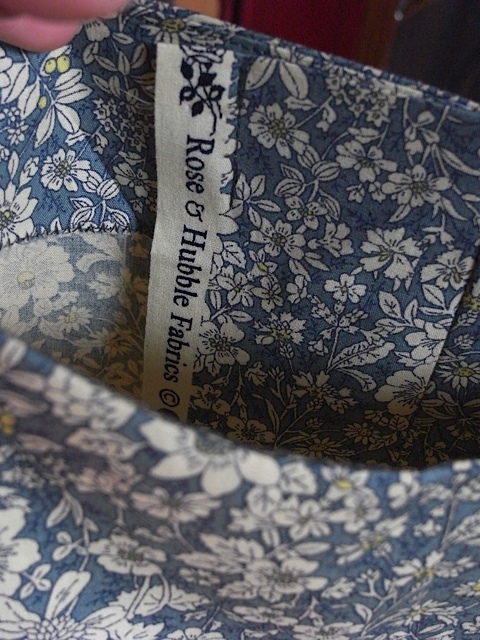 Its a shame as I really love the pattern of this fabric and I love the feel of the fabric, but at the moment I don’t think I’ll be buying anymore. Its too expensive to not be entirely happy with it, don’t you think? 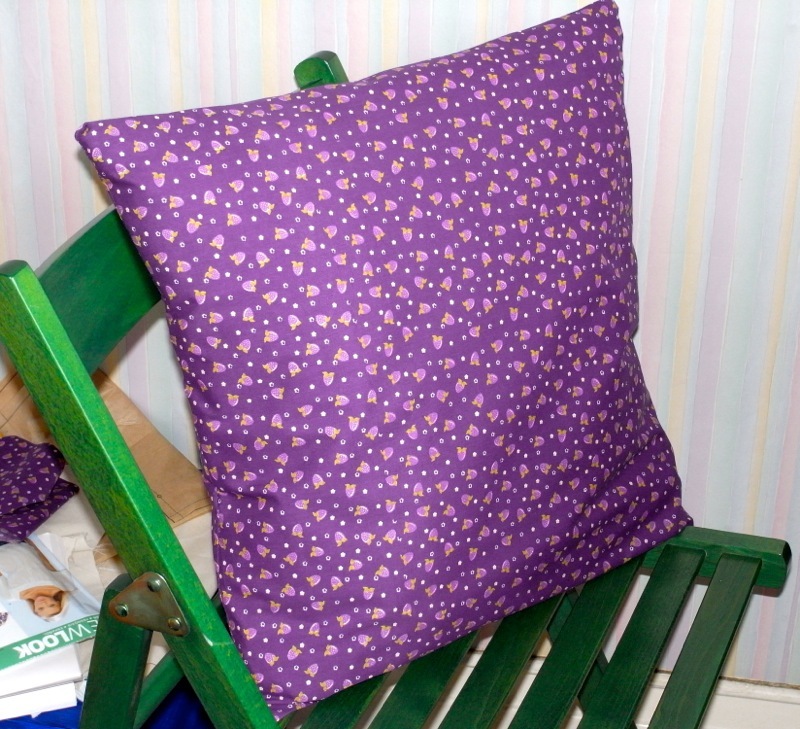 I used some gorgeous fabric from… Yes, you guessed it, Merchant & Mills. 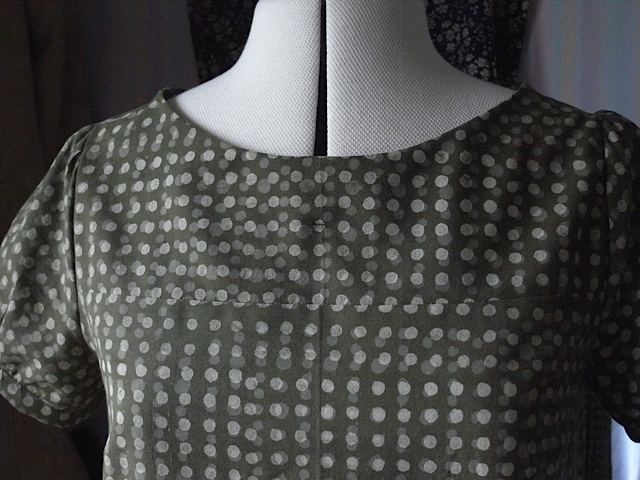 Its not on their website anymore so I won’t be posting a link, but its a gorgeous green dotty indian cotton. 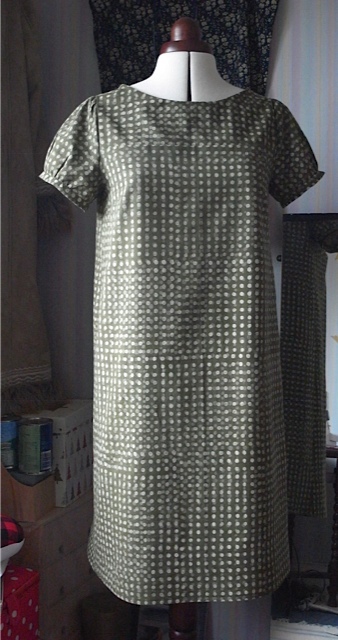 I’m so loving the Indian cottons, its such a beautiful fabric. Feels soft against the skin, hangs nicely and washes really well. 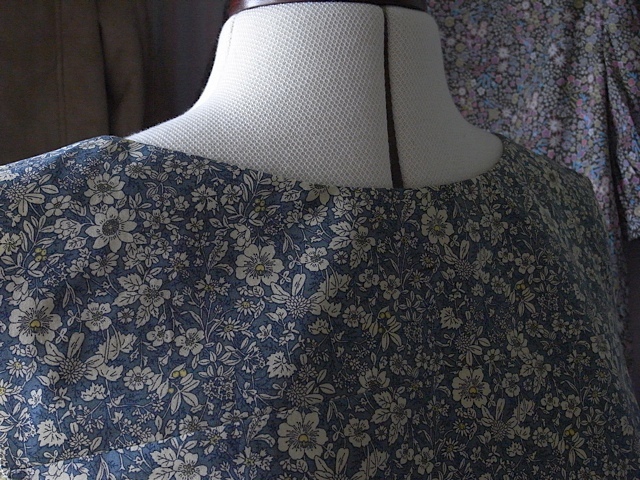 Its really hard to capture the true colour of this fabric. Keeps looking more khaki in the pictures. This shows the colour quite well. 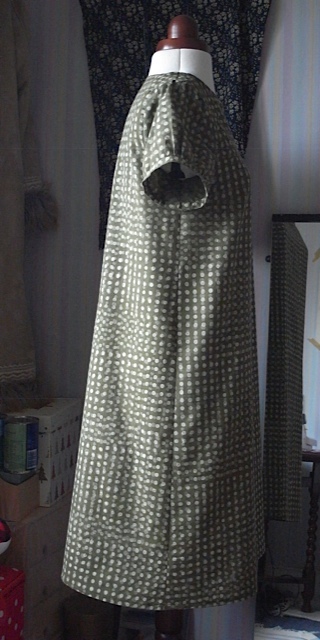 Hmm suppose it is quite khakish! 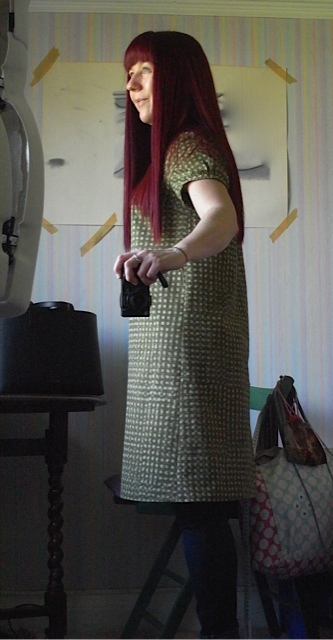 I have to say, I really love this dress. 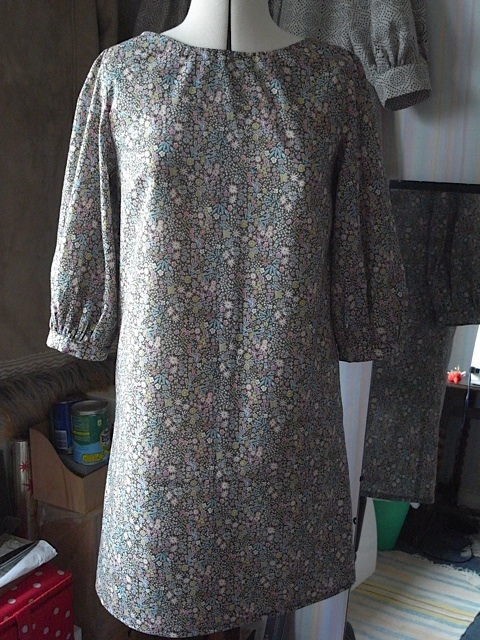 Its got the shape I like the length is perfect for me, I love the sleeves and its so comfortable to0. Get ready peeps, there will be more where this came from! 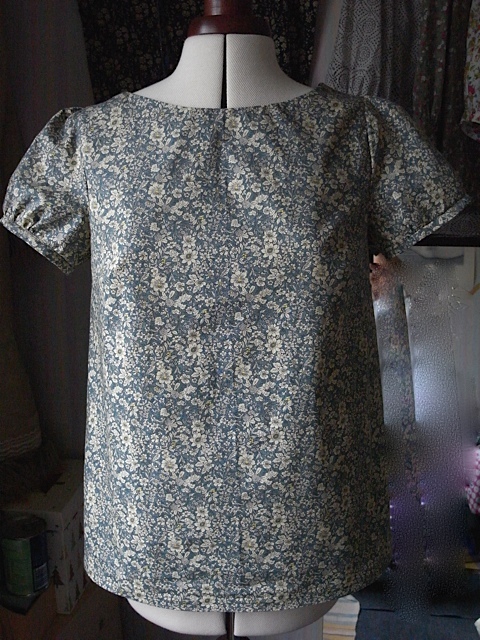 I have decided to just embrace the fact that I love this style of top and that I will be making it in lots of different fabrics, and sometimes the same fabrics. I am a creature of habit and when I know what I like, I know what I like. So if you’re after a blog that shows you lots of different garments then I’m afraid you are in the wrong place my friend. 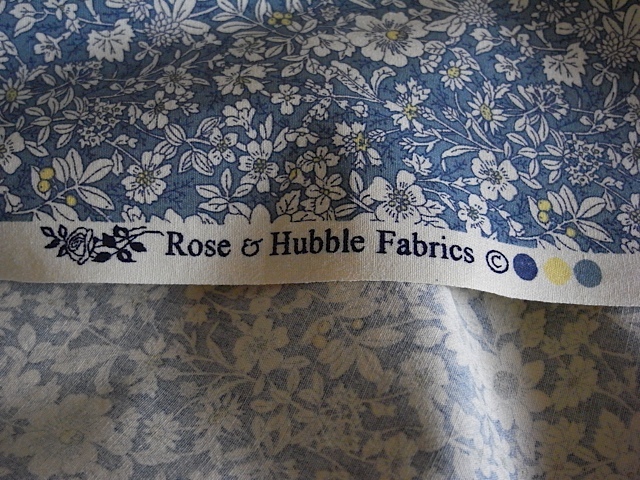 I love this fabric, its a cotton poplin. 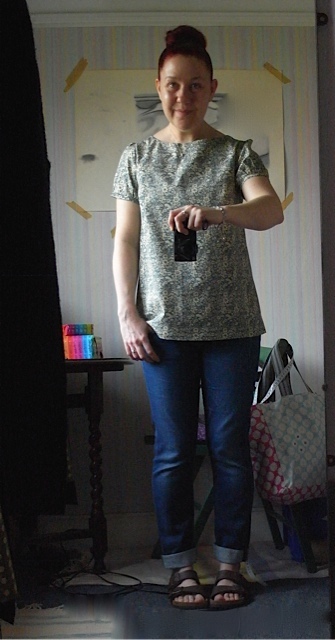 And at £6 a meter (I bought a meter and a half) this top cost me a mere £11. 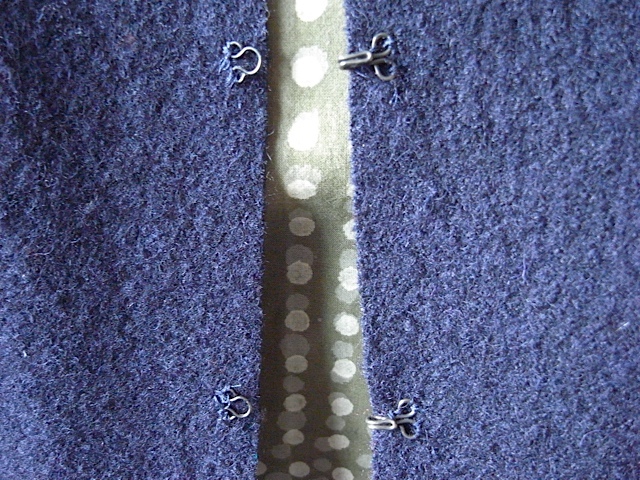 And that includes the matching thread. I love the pretty selvedge. 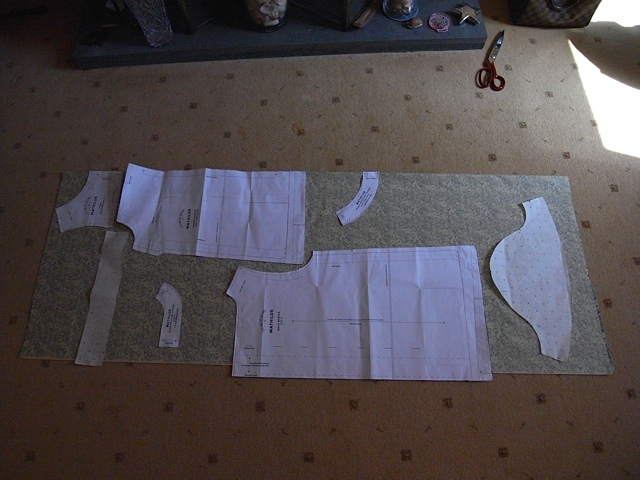 Very happy to get all the pattern pieces on the right way round on 1.5meters of fabric. And its only about 110cm wide. I know it looks like it doesn’t fit, but it worked out perfectly. Its usually at this stage I think I don’t like it. 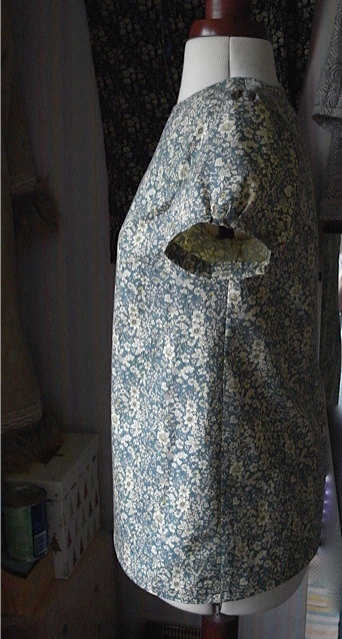 I’m never very impressed until I’ve added the sleeves. There we are, much better. Loved the selvedge so much I kept it. 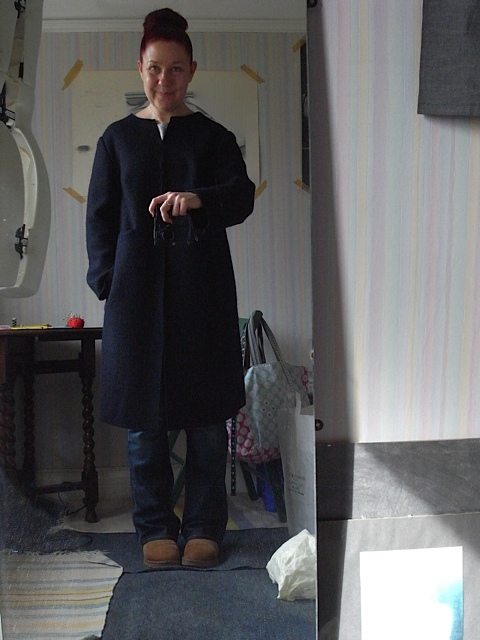 This is the last time I shall mention this coat, promise! 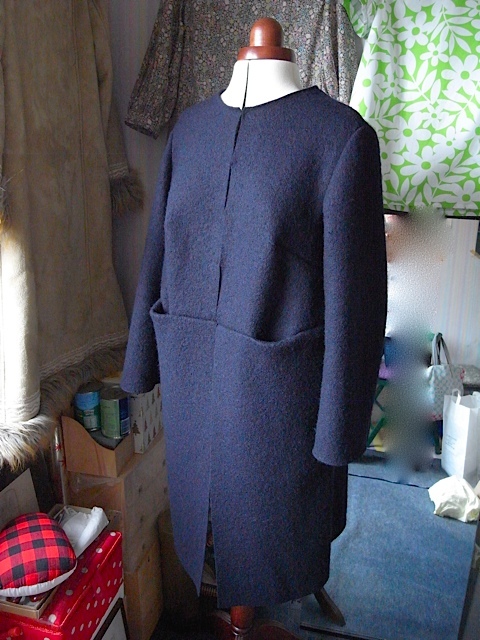 After I cut off the extra fabric from the skirt section of the coat I decided I wanted to add the hook and eye fasteners. 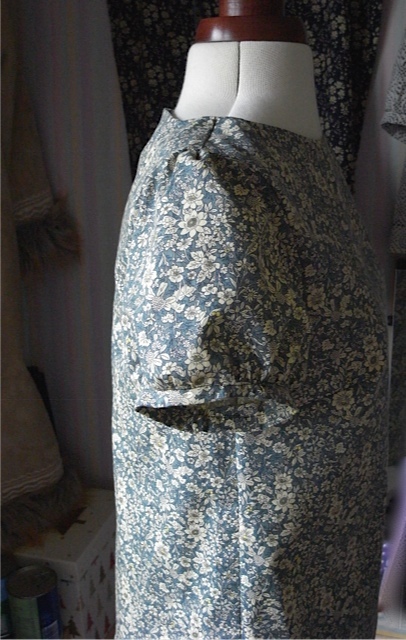 And can I just add that I’m so glad I haven’t used a fabric that needed a facing, as all I can say is that to add the hook and eye with the facing looks really complicated to me. 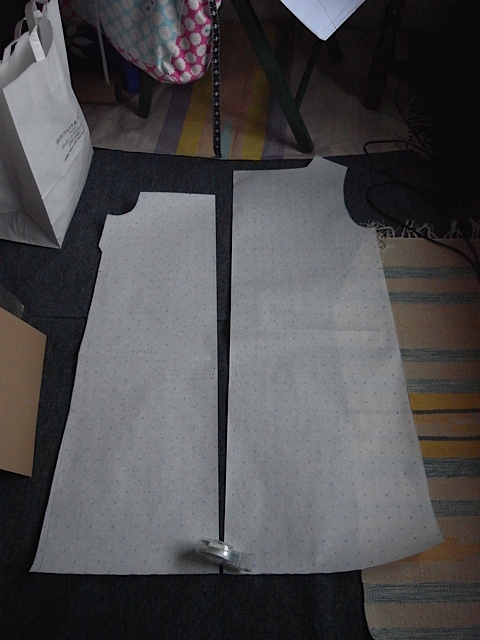 It was fairly straight forward, once I did away with the idea of measuring out where to place the hook and eyes and just did it by sight. 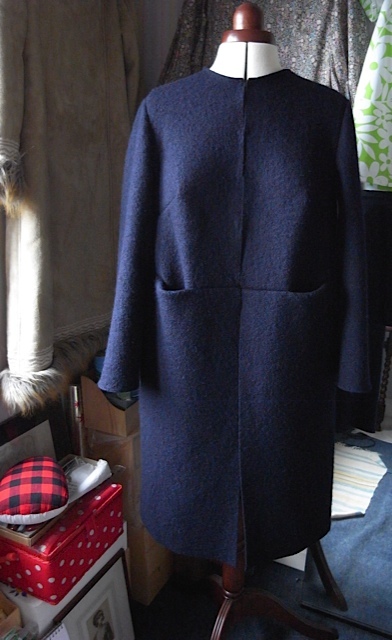 I hung the coat inside out on Gertie and just went for it. 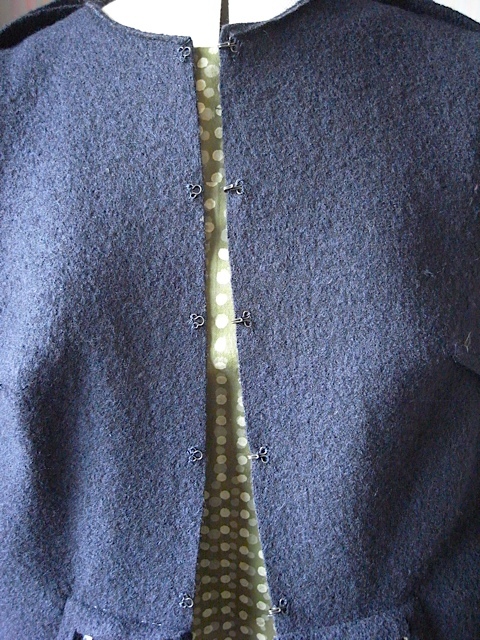 I watched a youtube vid first, of someone attaching hook and eyes, as I wasn’t entirely sure how best to do it. So glad I did as it made it easier. I managed to put most of them on evenly spaced, I think there’s one pair that are a little further apart than the others but I’m not too worried. I’m really happy with how it looks now, and I feel so much better knowing I can do it up. 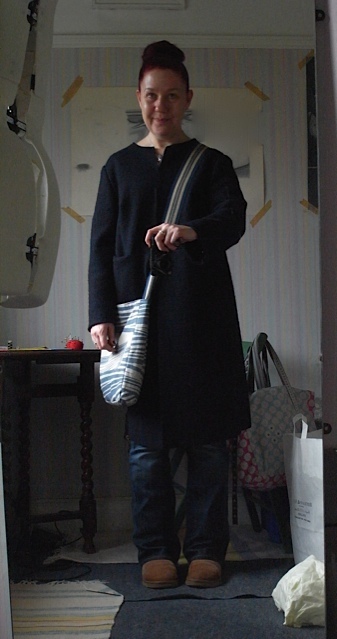 Here I am wearing a coat, top and bag I made and jeans that I’ve shortened. Man do I feel smug! Have you ever made something that has evolved over time?